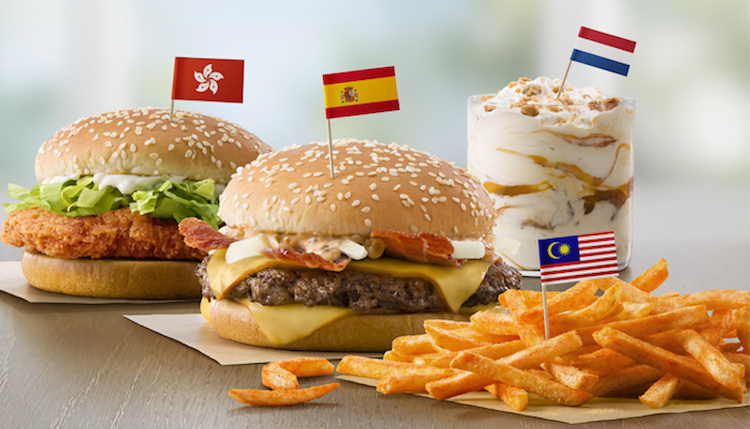 McDonald's Testing International Menu: STROOPWAFEL MCFLURRY, MCSHAKER FRIES, MCSPICY CHICKEN & GRAND MCEXTREME BACON BURGER! McDonald's is now test marketing popular international menu items at select locations in South Florida as part of their "Flavors from Abroad" promotion. At 50 locations in the Miami area, you can now order a Stroopwafel McFlurry from the Netherlands, BBQ McShaker Fries from Malaysia, a McSpicy Chicken from Hong Kong and a Grand McExtreme Bacon Burger from Spain. The McFlurry is especially tasty with sweet bits of caramel stroopwafel cookie swirled with cool vanilla ice cream and sticky caramel sauce. The crispy McSpicy Chicken is a little tangy and sweet with a nice spicy bite that tastes wonderful with the smooth mayo, fresh lettuce and soft sesame seed bun. The McShaker fries come with a BBQ flavor packet that you pour over your fries then shake in a bag. The flavor is instantly familiar as it reminds us of the sweet BBQ potato chips you commonly find in the snack aisle here in the USA. We didn't get around to the Grand McExtreme Bacon Burger but it's a regular Quarter Pounder with McBacon Sauce, applewood smoked bacon, gouda cheese and sliced onions. For more information on how you can try these international items for yourself, click HERE.